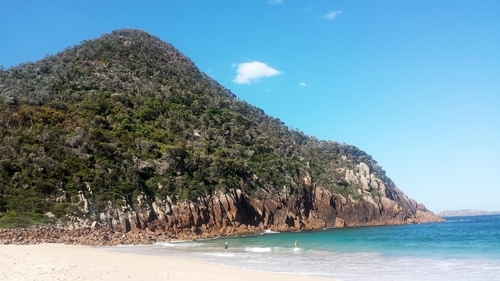 With 26 golden beaches, a vast blue bay and many beautiful inlets, Port Stephens is an idyllic beach getaway. Freshly caught seafood, local winery and alfresco waterside dining are all available at cafes and restaurants in Nelson Bay and Tea Gardens. Port Stephens is home to a prominent dining scene characterised by its diversity and use of locally sourced ingredients. From hand-shucked oysters to fresh avocados, figs and macadamia nuts, the Port Stephens region is abundant with beautiful produce and flavours. This region is also the birthplace of several quality wines and craft beers. Take the chance to sample some of them by visiting the local Brewery or Winery. It is home to around 150 bottlenose dolphins, and there are plenty of tours departing from Nelson Bay which offer dolphin watching opportunities and kayak trips. With its winning combination of sandy beaches, national parklands and rugged coastlines, Port Stephens is the perfect place to get in touch with nature. Whale watching is also popular during the annual migration season between June and November. See these majestic animals on a whale watching cruise, or from a headland in Tomaree National Park. Outdoor adventurers can also be enjoyed year-round with water sports such as diving, snorkelling, swimming, surfing, sailing and ferry rides. Other outdoor activities include quad-biking and sand boarding at Stockton Sand Dunes, as well as horse riding through the region’s parklands and along its scenic shorelines.